ITmk3 process is also known as Iron making Technologies mark 3 and is based on coal reduction technologies. IT mark 1 is the iron making process by blast furnace while the IT mark 2 is the iron making by direct reduction mostly by gas based reduction processes (Fig 1). The laboratory testing of the process was carried out during 1996 to 1998. During the period 1999 to 2000 a small pilot plant of capacity 3,000 tons per year was constructed and operated at Kakogawa Works of Kobe Steel, Japan. In the years 2002 to 2004 a pilot demonstration plant of 25,000 tons per year was constructed and operated at Minnesota, USA. The construction of first commercial plant of capacity 500,000 tons per year started at Hoyt Lakes Minnesota in 2007 and the operation in this plant started in January 2010. This process has been developed by Kobe Steel and is environmental friendly. In this process, self reducing–fluxing dried green balls are reduced, carburized and smelted. The self reducing fluxing dried green balls are produced by agglomeration of iron ore fines, limestone as flux, bentonite as binder and boiler coal a reducing – carburizing agent. 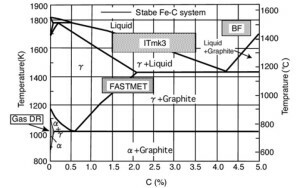 The process on Iron Carbon phase diagram is shown in Fig 2. ITmk3 process produces high purity granular iron (Iron nuggets by using iron ore fines and non coking coal. 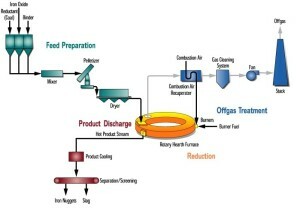 The process is distinctive with reduction, carburizing melting and slag separation (Fig 3). The process occurs at lower temperatures (Around 1350 Deg C) and hence different from conventional iron making by blast furnace. In the ITmk 3 process the reduction reaction takes place in 10 minutes unlike 8 hours in blast furnace and 6 hours by the gas based DR processes. Utilization of low grade iron ore fines which is minutely grinded and beneficiated in order to produce high grade iron ore concentrate. This concentrate is converted into green pellets. Non coking coal is used as a reductant. The pellets are charged into a Rotary Hearth Furnace (RHF), heated to 1350 Deg C, reduced, melted and separated into metal and slag. The molten iron is solidified into nuggets in the furnace, discharged after cooling and separated from the slag. The process is simple and uses conventional equipment. 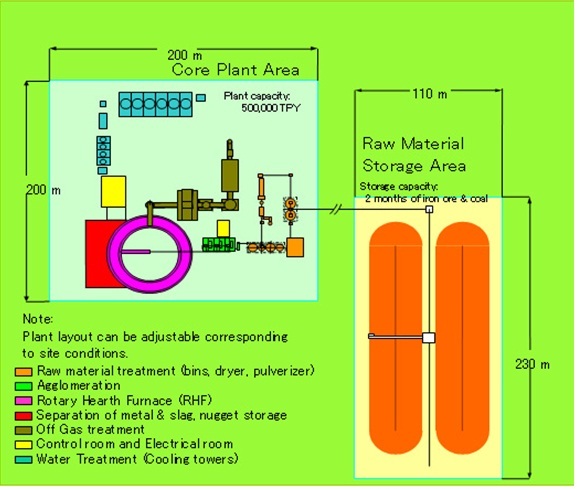 Further the small retention time also facilitates the start up and stopping of the plant. Iron ore fines and pulverized coal are agglomerated into composite pellets. The reactions between iron ore and coal remain the same as for the general iron making process and are given below. 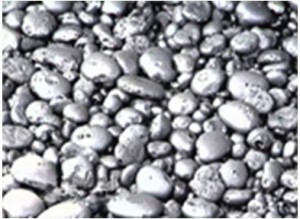 ITmk3 produces slag free Iron nuggets (Fig 5) which have similar chemical and physical properties to those of pig iron. It has a metallic iron content of 96 – 97%, C content of 1.7- 3.5 %. Sulphur levels in the nuggets are around 0.5%. The density of iron nuggets is in the range of 6.5-7.0 gm/CC. Iron nuggets have better meltability than blast furnace pig iron since it has a low melting point and higher thermal conductivity. Iron nuggets are having size which helps in easy transportation and handling. They do not reoxidize and also do not generate fines during handling. Another advantageous feature of the iron nuggets are that they can be continuously charged into the Electric Arc Furnace similar to DRI/HBI. ITmk3/EAF steel making produces lesser pollutants relative to Coke/BF/ BOF route. It allows direct reduction of iron ore fines with non coking coals. The process is energy efficient. It consumes approximately 30% less energy than BF. Use of cheaper raw materials such as iron ore fines and non coking coals. The process produces high-grade iron nuggets with better meltability than pig iron during the steel making stage. The process eliminates necessity of handling molten iron. Operation and adjustment of the process is simple. The process also facilitates the production adjustment by starting and stopping. The equipment used in the process are simple and with proven reliability. Who can give us this technology? What is the cost to set up such a plant? What are the maximum capacity of such a plant.? Midrex Technologies India Private, Ltd.